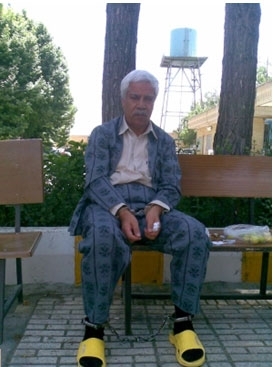 Hashem Khastar is a dissident 55 year old Iranian teacher who was sentenced to two years imprisonment in 2009. He has spent the last two years of his sentence in Mashad's notorious Vakilabad prison. Poor hygiene conditions and serious overcrowding has been detrimental to his health and he has been denied any leave from prison. Yet this elderly retired teacher has stood resolute with his head held high. In July 2010, he wrote an open letter to the head of Iran's judiciary and described the appalling prison conditions in Vakilabad prison. Four days ago, his sentence ended. He should have been released and family and friends were waiting for him outside the prison gates, but Hashem was not released. The judiciary have now opened a new file against him for the letter he wrote to the judiciary. Hashem now awaits a new trial and a new sentence. Not only Hashem was not released, his local butcher friend, who had also come to greet him outside the prison upon his release, was also arrested. Once again, if you try to openly appeal for justice, common sense and a proper rule of law in the current Islamic Republic of Iran, then you might as well invite some new spiteful knee jerk reacion crime invented against you! In otherwords, spoilt and very cowardly thug ego's now run the judicary of Iran... Bully boy children who hide or ignore any little conscience they may have left... Ramadan is coming... But does this mean the Iranian people will still constantly starve themselves of a conscience and a proper democracy too? What a shame. This man is only telling what he believe that is right. Freedom for all people and justice and not surpressing any woman or man for his believes. We in Holland have that freedom and although it is not a wonderful country because of some politicians are against the wole Islam and the people who see that as their religion. But all over the world are extremists. In the Christianity and Orthodox extreme Jewish religion and so on. Where people are not respect the believes of another person , there will be war. I want freedom over the whole world. Hope that one day this will come.